With Leadpages, you can use any number of tools to collect new leads—from our drag-and-drop templates, to SMS opt-ins using opt-in texts, to pop-ups on your site. This article explains how to connect each of these tools to the list, form, campaign, or workflow you’ve created and where your leads will ultimately go. NOTE: Before using this guide, we recommend integrating your Leadpages account with at least one outside service. To learn more about integrating with third-party services, see Connect Your Integrations. Edit any drag-and-drop page, site or pop-up (or create a new one). Hover over your form and click Edit Integrations to open its settings. Keep in mind, your form might be within a pop-up on the page. Select your integration from the menu, then choose the specific list where you’d like leads sent. Be sure to Update at the top-right corner of the builder. TIP: After making changes (i.e. requiring form fields, creating a new list etc.) within your integration service, we recommend clicking ⟳ Refresh List inside of your page or pop-up form settings. If you don’t see your integration service, you should be able to add it under +More Services. For full details, take a look at Connect Your Integrations. NOTE: Depending on which service you’re integrating with, you might not be sending leads to a list, but rather to a form, webinar, or something else entirely. For more information, check out our service-specific articles here. The steps above will also work for standalone Drag & Drop pop-ups that you publish to your site. 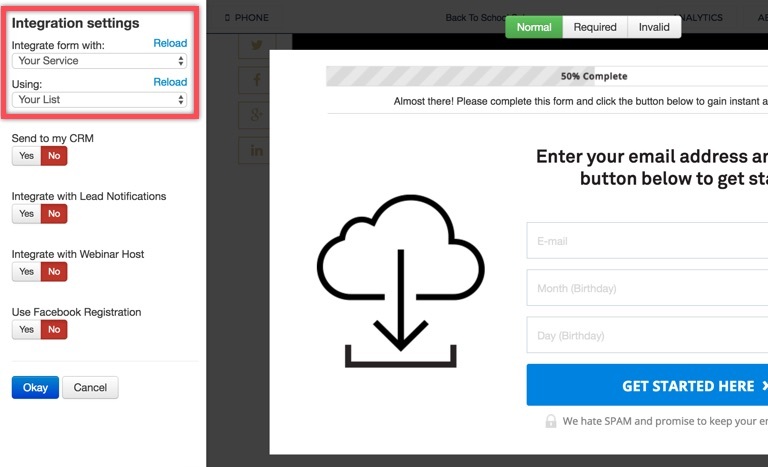 Just create or edit a pop-up, then follow steps 2–5 from above. Create a new Standard page, or edit an existing one. Locate your call-to-action (CTA) button and click it to bring up your opt-in form. You may have several CTAs on your page, but any button that brings up a form will work. Click Integration settings in the left sidebar. Choose your service from the “Integrate form with” menu. Under “Using”, select the list (or form, webinar, etc.) where you’d like to send new leads. Click Okay or Customize this form to save your settings, and confirm your changes in the popup alert. Click Okay again to save your opt-in form. Then, click Save in the top-right corner of the editor. Configuring where your leads go to in standalone (Standard) pop-ups is nearly the same as doing it in Standard Lead Pages. Follow steps 3–6 from above. Click Save in the top-right corner of the pop-up editor. TIP: You don’t have to republish your pop-up code if you’re just changing your integration settings—everything should update automatically. Click Create New Opt-in Text or click the pencil icon next to an existing opt-in texts to edit it. Fill out or edit the first three parts of the opt-in texts as needed (get full instructions here). Then, click Continue». Select the “Add customer's email to my mailing list” option. Choose your service and list from the drop-down menus that appear. Confirm that everything is set up how you’d like in the Your Leaddigit® in Action box. Then click Save & Close. Create a new trigger link, or edit an existing one. Click Integration settings in the left-hand sidebar. Select your destination service from the “Integrate link with” drop-down, then choose your lead destination from the “Using” menu. Configure any other integration settings you’d like (such as Lead Notifications), then click Okay. Under Step #1 in the pseudo message to the right, choose the service you’d like to send leads from. If you don’t see the your service there, select the “Custom” option. Save your trigger link in the top right corner.